Our planet is warming; it's significantly warmer in the 21st century than it was in the last third of the 20th century. Indeed, four of the warmest years on record have occurred in this century. This global warming is being forced by the unabated burning of fossil fuels pouring CO2 into the atmosphere ... And this warming appears to be forcing dramatic regional and worldwide climate shifts. 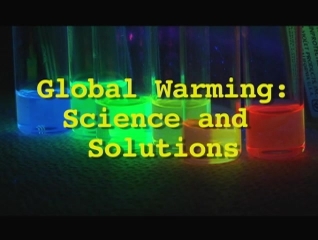 This series takes you through the Science of Global Warming and the Solutions. We need only to trust the science and work together to implement these solutions... solutions we can no longer afford to ignore. Global Warming, climate change and meteorology are a part of Earth Science and Environmental Studies. 00:05:26Earth's climate has changed before because of the amount of CO2 in the atmosphere, and as a result, Earth's history has had Ice Ages. 00:11:32The Industrial Revolution used fossil fuels - coal, oil, natural gas - which released huge amounts of CO2 and pollutants into the atmosphere raising global temperatures, as shown by Dr. James Hanson, and leading to the Kyoto conference on climate change. 00:05:39The Hydrological cycle involves water, H2O, and is part of the dynamic global balance that under the Greenhouse effect can melt glaciers raising the oceans and leading to extinction. 00:01:07BioGeoChemical cycles circulate atoms, molecules and particles through the atmosphere. 00:05:07The Nitrogen Cycle shows how nitrogen is beneficial to plants through nitrogen fixation, but in the anthropocene era high levels of nitrogen oxides hurt the ozone and increase the greenhouse effect. 00:02:23The Methane Cycle, involves methane which is more abundant than, natural gas, has a great impact on the greenhouse effect and could cause extinction through a methane burp. 00:02:38The Aerosol cycle involves aerosols, which are minute particles suspended in the atmosphere. 00:05:47The Carbon cycle is driven by life itself since carbon is found in all living things as well as fossil fuels such as coal, which releases carbon dioxide, CO2, a potent greenhouse gas creating the greenhouse effect. 00:04:46The Greenhouse effect is caused by greenhouse gases - carbon dioxide, CO2; water, H2O; Methane, CH4; and nitrous oxide, N2O. 00:06:17A Greenhouse Gas which produces the greenhouse effect is carbon dioxide. Energy to run the Earth's industries and homes comes from energy fuels such as fossil fuels - coal, oil and natural gas, but there are other energy fuels which are alternative energy, which can be sustainable and better for the planet. 00:05:12Global warming solutions involve adaptation and mitigation to work with changing ecosystems. 00:05:34Mitigation is a means to reduce the carbon dioxide, CO2, in the carbon cycle, as shown in the Kyoto Treaty and can be seen in using water power to turn turbines as a generator of electromagnetic induction. 00:04:50Wind power is used by a wind machine, also known as a wind turbine, whose turbines catch the wind and convert mechanical energy into electrical energy. 00:05:48Hydrogen fuel is being investigated by the National renewable Energy Laboratory, where the means to create vast amounts of hydrogen to be used in a fuel cell are being investigated..
00:04:17Photo Biological Hydrogen from the algae, clamata Monus, is a photosynthetic hydrogen, a form of bio-energy. 00:06:00Ethanol one of the biofuels, is being researched at the National Renewable Energy lab, and uses corn and enzymes, similar to alcohol, to produce fuel such as gas or liquid gas, that can be used in a flex-fuel vehicle. 00:05:22Thermal Chemical Conversion uses a biomass to create a liquid fuel such as hydrogen or methane and is carbon neutral. 00:07:18Solar, or solar power, employs photovoltaics, solar cells, and is currently undergoing a new generation of technology that uses semiconductors, nano crystals and quantum dots. 00:08:11Adaptation is how humans will cope with a changing world such as the sea level goes up as with the sea rise.